On Saturday, January 12, new Alex and Andy went on a ride that seemed less than wise and rather adventurous to start with and ended up pretty stupid and really fun. Photos by Andy and Alex B. 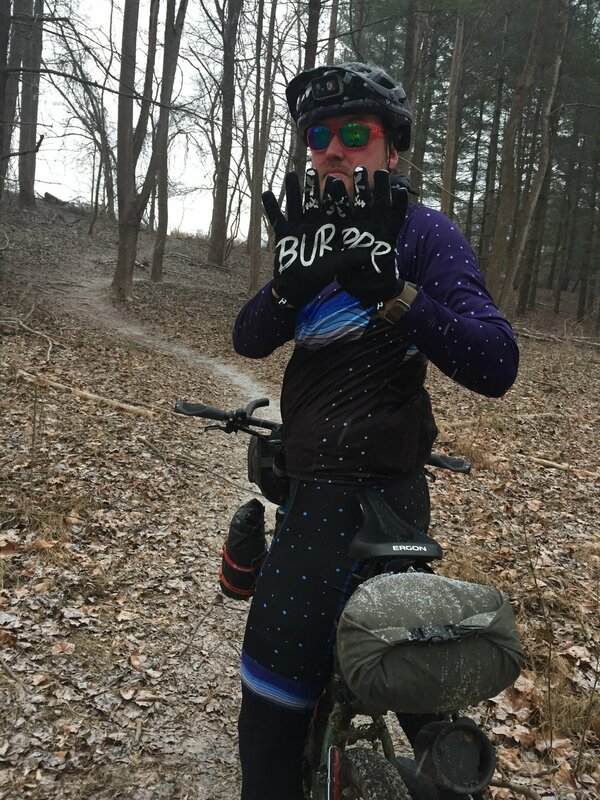 To prepare for Huracan 2019, a 380 mile bikepacking race in Florida, Andy needed a shakedown ride to test his complete set up on pavement, gravel, and singletrack. I, Alex, the newest member of the club with a “say yes to adventure” policy, agreed to partake in Andy’s 70 mile route without considering a) what terrain would be ridden b) how long the ride would take c) how much food I would need to survive or d) what the weather would be like when we finished. Even Andy himself was filled with “hesitation and trepidation” – words I ignored then but will never ignore again. But, since I’m here to write this, you can rest assured that I survived. I met Andy at about noon in Georgetown, fully aware that the forecast called for snow that evening and through the weekend. We figured we might see some flakes, or even ride on a snowy C&O canal on the way home, but with full hearts and lots of layers, we headed out of DC on the C&O canal. I was riding my Trek Crockett with 35mm file tread tires, and Andy his aforementioned bikepacking rig, a Kona Unit set up with a 100mm suspension fork and Shimano XT 1x11 - complete with bags-a-plenty. As we rode down the canal, we experienced generally positive ride conditions – 37 degrees, overcast skies, and little wind. We rode for about 20 miles before arriving at the first section of singletrack. When Andy first mentioned that we would be riding singletrack, I was already on my bike, rolling down the canal next to him. I wasn’t too concerned, given that I had ridden a meaningful amount of singletrack on various cross bikes. I had never, however, started riding singletrack 20 miles into 60+ mile ride. Andy took the lead on the first trail, navigating his fully loaded 29er (that thing had to weigh 60 pounds) along the trail with moderate ease. As I entered after him, I immediately rode through a patch of mud, spun out my rear tire, and put BOTH feet down in two inches of the peanut buttery mud that we MABRA cross racers have come to know and love. My feet were officially wet, with only toe covers to protect them, and we had a long way to go. The first stretch of singletrack went off without incident. I rode cautiously but had a ton of fun following Andy’s lines and trying to catch him on the climbs only to be dropped once we started moving downhill. My main takeaway: damn, riding gravel and singletrack is exhausting. I had eaten all the food I brought at this point, about 28 miles into the ride. Luckily, as we hopped onto pavement, just as a few snowflakes started to fall, Andy suggested we ride up to Rockland Winery to grab some extra provisions. It was there I realized my feet had gone numb. We stocked up on snacks and were on our way. Flakes started to fall harder as we made it to our second and final singletrack section of the day. We rode part of the 30-mile loop in the Seneca Ridge trail system. Andy advised that it’s more fun if you drive to the trailhead rather than ride to the ride... Cool. At this point I’m still having fun but my hands are starting to go the way of my feet – numb. 32ish degrees and lightly snowing. By the time we were finishing the second stretch of singletrack, the snow was falling fast. We could hear nothing but falling snow in the woods as we completed the last of the 5 miles of singletrack for the day. There could have been more, but Andy wisely rerouted us as it was quickly becoming dark. We rode some reasonably hospitable roads out of the woods and to a coffee shop in Darnestown, where I had a startling realization – although we had reached civilization, we still had to get HOME. As we chugged coffee and I filled my pockets with still more candy and chips, feet still numb and brain not willing to reason out exactly how long we had left on the bike, we left Darnestown at 6pm in near darkness and light snow. We rode some dark, busy, and wet roads for about 10 miles as we watched snow accumulating on grass and non-treated roads. At about 6:45, we arrived at the C&O canal, mile marker 16. Complete darkness, snow falling. The next hour and 45 minutes is pretty vague in my mind. We were cold. We were surrounded by a tunnel of darkness, lights aimed at the bright white, barely disturbed surface of the C&O canal towpath covered in an inch of snow. Flakes fell fast enough to flicker in our lights and hypnotize us. We were both cracking and conversations were few and far between. We enjoyed following the tracks of what we decided was a fox – we chased him for miles but never got to say hi. I suffered in a way I hadn’t ever experienced; I wasn’t winded, cramping, or feeling my heartrate spike, yet I was completely spent. And cold. Getting home was the only option, and there was only one route home. It wasn’t a great option, and the combination of weather/time/light was super stupid for sure, but part of me was still elated to be on a bike and the adrenaline of the adventure and survival instinct kept me going. We eventually arrived back in Georgetown but we both had a few miles left to ride back home. When I got into my apartment, I definitely shed a few tears of joy. I had been out for 9 hours on a ride that I was way less prepared for than I thought, and it had been miserable and amazing. I learned what #recklessinpursuitofglory meant that day, and plan to continue being reckless, but maybe also a little more prepared.